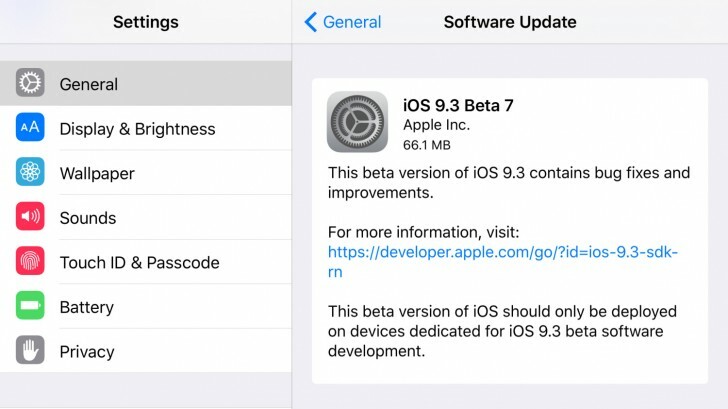 Apple has started seeding the iOS 9.3 beta 7 release for developers and public beta testers. This is the last beta release of the OS before its expected public release next week. The iOS 9.3 beta 7 includes a new Night Shift mode that changes the display temperature at night for less eye strain. Another new feature is the Touch ID and password-protected items in the Notes app. Finally, there are new CarPlay features and expanded 3D Touch options on apps, which now includes the Settings menu. iOS 9.3 BETA 1 had nightmode on months before even android n perviwe launched.